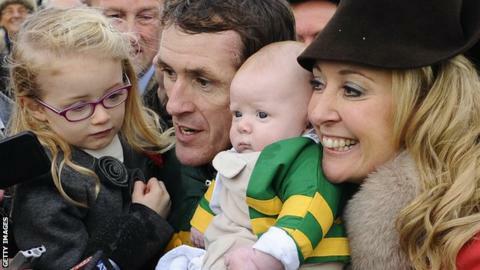 AP McCoy's wife says she would "trade every winner" of her husband's career to get the 19-time champion jockey to the end of the week "in one piece". McCoy, winner of more than 4,300 races, will retire after riding at Sandown on Saturday, when he will be crowned champion jockey for the 20th time. "Since he made the announcement it has been a huge sense of relief for me," wife Chanelle told BBC Radio 5 live. "He goes to work every day with an ambulance following behind him." McCoy, 40, has been champion jockey every season since 1996 - his first year as a professional. He was the first jockey to be named BBC Sports Personality of the Year, after winning the Grand National for the first time at his 15th attempt. In a career spanning almost 20 years, McCoy has broken bones in almost every part of his body. Chanelle, his wife of almost nine years, said: "There's a week to go to get him out in one piece. There will be sadness, but it will be a fantastic time and celebration." She said McCoy's forthcoming retirement only hit home after he raced for the last time at Cheltenham, where he has won two Gold Cups and three Champion Hurdles. "He was a little bit choked after that," she said. "It was probably the first time it has hit him. "The day-to-day routine he will miss... the jockeys in the weighing room." Chanelle, who has two children - Eve and Archie - with McCoy, hoped her husband would retire in 2013 after he suffered a punctured lung following a heavy fall. With air pockets around the heart, there was a high risk of a heart attack - something not revealed to the public at the time. Chanelle felt her husband was thinking about retirement but, when he recovered and returned to racing, the injury became "a distant memory". Her favourite moment was when McCoy reached 4,000 winners on Mountain Tunes at Towcester in November 2013, followed by winning the Grand National on Don't Push It in 2010. "The day he won 4,000 winners and the children were there really stands out," she said. "The Grand National was a fantastic day but 4,000 winners was special." Chanelle, who describes McCoy as "a better person than he is a jockey", is now looking forward to another memorable family day out. "Sandown will be a celebration with friends and family," she said. "We will leave emotion and emptiness for another day and not for Sandown. "It will be a day of celebration, celebrating his career and - fingers crossed - he gets out in one piece, and remains injury free for the next week." Listen again to Chanelle McCoy's interview on BBC Radio 5 live's Sportsweek via the BBC iPlayer.